The Patriots had taken a 31-28 lead on Rex Burkhead’s touchdown run, but the Chiefs needed only two big completions from Patrick Mahomes to set up Butker’s tying field goal. Tom Brady threw a 25-yard pass to Rob Gronkowski on third down to set up Rex Burkhead’s 4-yard TD run, giving the Patriots a 31-28 lead over the Chiefs with 39 seconds left in the AFC title game. Brady’s throw to Gronkowski came moments after his pass had skipped off the veteran tight end’s hands for what appeared to be a clinching interception. But a flag on the far side of the field wound up being offsides on Chiefs linebacker Dee Ford, giving the Pats another chance. The Pats had regained the lead on Sony Michel’s 10-yard TD run, only for Kansas City to answer with a quick 68-yard drive. The Chiefs can thank Patriots cornerback J.C. Jackson, whose holding call gave them one first down and whose pass interference call gave them another. The Patriots are back on top of what’s suddenly a back-and-forth AFC championship game. It was the All-Pro quarterback’s second TD throw of the second half, and he suddenly has 186 yards through the air. Much of it has gone to Sammy Watkins, who has three catches for 76 yards. Kansas City got the ball back moments later in a wild sequence. Moments after officials determined via replay the Patriots’ Julian Edelman had not touched a potential muffed punt — the ball was mighty close to his right thumb — Daniel Sorensen intercepted a pass that bounced off Edelman’s hands and gave Kansas City the ball in New England territory. Still, the quick-strike drive by the league’s highest-scoring offense brought the crowd back into the game, and it put some pressure on Tom Brady and the Patriots to respond. It was Brady’s first career interception from the 1-yard line. He was 49 of 71 with 43 TDs before that play. The Saints faced third-and-10 from the Rams 13 in the final two minutes when Los Angeles defensive back Nickell Robey-Coleman slammed into Tommylee Lewis, connecting helmet-to-helmet, while Drew Brees’ pass was still in the air. Payton and the Saints were livid when no flag was thrown. The missed call started a sequence that pushed the game to overtime. Payton says officials on the field told him Robey-Coleman “arrived at the same time that the ball did.” Payton got on the phone with the league to discuss the call immediately after the game. “We lose a chance to go to the Super Bowl with a call like that, it’s just disappointing,” Payton said. Brady was 7 of 9 for 64 yards, clinically slicing up the Chiefs’ defense. 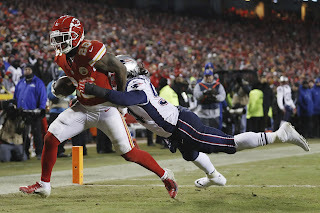 The Patriots have taken a 7-0 lead over the Chiefs after a grinding, 15-play, 80-yard drive that consumed more than half of the first quarter and ended with Sony Michel’s touchdown plunge. Now, it’s up to Chiefs quarterback Patrick Mahomes and the league’s highest-scoring offense to provide an answer. New Orleans’ Wil Lutz followed with a 31-yard field goal with 1:45 left. Los Angeles then drove into Saints territory to set up Greg Zuerlein’s tying 48-yard field goal with 19 seconds left to make it 23-23. The Los Angeles Rams cut New Orleans’ lead to 20-17 with a short touchdown pass from Jared Goff to Tyler Higbee late in the third quarter. After allowing the Rams to score the last 10 points of the first half, New Orleans’ defense quickly forced a punt on Los Angeles’ opening possession of the third quarter. After retaking possession, Saints methodically drove 71 yards with a mix of power runs by Mark Ingram and short receptions by Alvin Kamara. Kamara caught four passes on the drive and has been the Saints’ top receiver in the game with 10 receptions for 88 yards. Ingram rushed three times for 25 yards during the series, including a 16-yard carry.